Amongst Adzom Gyalse’s many compositions, his commentary on Samantabhadra’s Aspiration to Good Actions (Skt. Bhadracaryapraṇidhānarāja, Tib. Bzang spyod smon lam) entitled The Excellent Mahayana Path of the Sacred Instructions of the Accomplished Scholars (Tib. mkhas grub dam pa’i zhal rgyun theg chen lam bzang) and concise commentary on the Guhyagarbha tantra entitled A Drop of Amrita (Tib. bdud rtsi’i thigs pa) became especially renowned. Adzom Gyalse commissioned many of the famous Adzom Gar woodblocks, which became vital in the preservation of important text of the Ancient School. Adzom Gyalse was succeeded as the holder of the Adzom lineage and Adzom Gar by Thubten Padma Trinle (Thub bstan padma phrin las, 1926-2001). Adzom Gyalse’s main biography entitled A Reflection of the Moon in Water (Tib. chu zla’i snang brnyan) was compiled by Padma Kunzang Rangdrol (Tib. Padma kun bzang rang grol, 1890-1973). His main students include Thubten Padma Trinle (Tib. thub bstan padma phrin las, 1926-2001), Padma Kunzang Rangdrol (Tib. 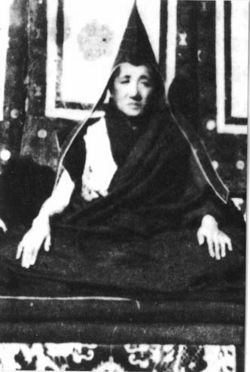 padma kun bzang rang grol, 1890-1973), Könchok Rinchen (Tib. kon mchog rin chen, b. 1922-? ),, Dilgo Khyentse Rinpoche, Nyoshul Khen Rinpoche, Jazi Amnye Drodul Pema Garwang Lingpa (Tib. ja bzi a myes ’gro ’dul padma gar dbang gling pa, 1901-1975), Tsunma Yulha (Tib. btsun ma g.yu lha, 1901-1980), Gojo Kharlek (Go ‘jo mkhar legs, ? ), Padma Tsewang Lhundrup (Tib. padma tshe dbang lhun grub, 1931-2001) Rago Choktrul (Ra mgo mchog sprul, ? ), Orgyen Rangdrol (Tib. o rgyan rang grol, ? ), Khyentse Rab Senge (Tib. mkhyen rab sengge, ? ), Karma Droje (Tib. karma rdo rje, ? ), Thubten Changchub Gyaltsen (Thub bstan byang chub rgyal mtshan, b.1943-? ), and Sangngak Tendzin (Tib. gsang sngags bstan ’dzin, 1917-1956). ↑ ’gyur med rdo rje, "sgyu ’phrul drwa ba’i lam rnam par bshad pa chung ngu’i ’bru ’grel bdud rtsi’i thigs pa," in bka’ ma shin tu rgyas pa (kaH thog), (Chengdu: kaH thog mkhan po ’jam dbyangs, 1999), 897-966. http://tbrc.org/link?RID=O003JR198|O003JR1984CZ292383$W25983. ↑ BDRC profile: [#!rid=P8099 https://www.tbrc.org/#!rid=P8099]. ↑ BDRC profile: [#!rid=P6455 https://www.tbrc.org/#!rid=P6455]. ↑ Samten Chhosphel, “Tubten Nyendrak,” on The Treasury of Lives, http://treasuryoflives.org/biographies/view/Tubten-Nyendrak/9588. BDRC profile: [#!rid=P6958 https://www.tbrc.org/#!rid=P6958]. ↑ Joona Repo, “Ayu Khandro Dorje Peldron, ” on The Treasury of Lives, http://treasuryoflives.org/biographies/view/Ayu-Khandro-Dorje-Peldron/13139. BDRC profile: [#!rid=P3AG24 https://www.tbrc.org/#!rid=P3AG24]. ↑ BDRC profile: [#!rid=P7552 https://www.tbrc.org/#!rid=P7552]. ↑ Sangngak Dorje, “Jazi Amnye Drodul Pema Garwang Lingpa” on The Treasury of Lives, http://treasuryoflives.org/biographies/view/Jazi-Amnye-Drodul-Pema-Garwang-Lingpa/P8850. BDRC profile: [#!rid=P8850 https://www.tbrc.org/#!rid=P8850]. ↑ Sonam Dorje, “Tsunma Yulha,” on The Treasury of Lives, http://treasuryoflives.org/biographies/view/Tsunma-Yulha/P4. BDRC profile: [#!rid=P4 https://www.tbrc.org/#!rid=P4]. ↑ BDRC profile: [#!rid=P3JM83 https://www.tbrc.org/#!rid=P3JM83]. ↑ BDRC profile: [#!rid=P9514 https://www.tbrc.org/#!rid=P9514]. ↑ BDRC profile: [#!rid=P3JM84 https://www.tbrc.org/#!rid=P3JM84]. ↑ BDRC profile: [#!rid=P1PD76612 https://www.tbrc.org/#!rid=P1PD76612]. ↑ BDRC profile: [#!rid=P9906 https://www.tbrc.org/#!rid=P9906]. ↑ BDRC profile: [#!rid=P3JM85 https://www.tbrc.org/#!rid=P3JM85]. ↑ BDRC profile: [#!rid=P3JM108 https://www.tbrc.org/#!rid=P3JM108]. ↑ BDRC profile: [#!rid=P2PD17380 https://www.tbrc.org/#!rid=P2PD17380].